It's Doug's (the caveman's) first day at work. 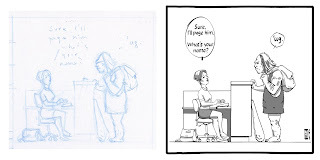 I chose to ink the second panel because it is most self contained, though I like the 3rd and 4th panels better. The previous post on this blog shows two designs for the studio's sign that will go over the door in the top left drawing. See?! I am kinda planning this thing! I like the supervisor's pose and extended hand in the 3rd panel, and I like how Doug is sitting, holding his club and backpack and Doug is nicely drawn in the 4th. He's got pretty severe cheeks, a prominent mouth, chin, nose and brows so he's not so easy to draw in 3/4 but it worked out well. 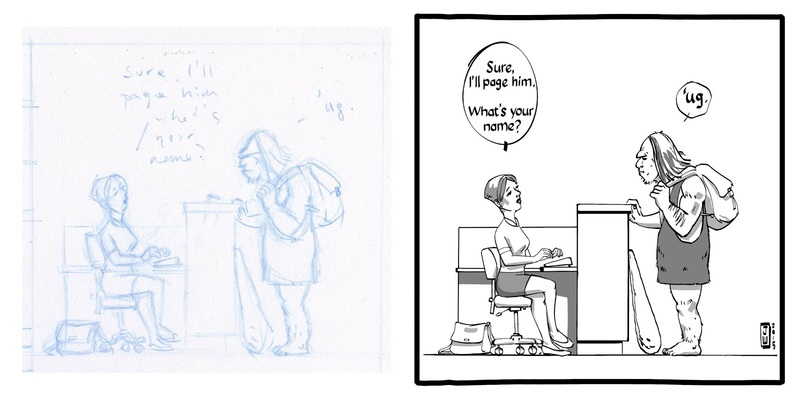 It's funny how when going from the rough to the inked, one sees the areas that weren't really planned out or thought about. I didn't really plan the receptionist's chair base in the rough, but had to work it out in the final where it looks quite nice. I think I like her face better in the rough than the inked, but if I'd followed the rough exactly, it wouldn't have looked very good - there is sometimes something suggestive in a rough that can't be (or simply isn't) captured in the final. 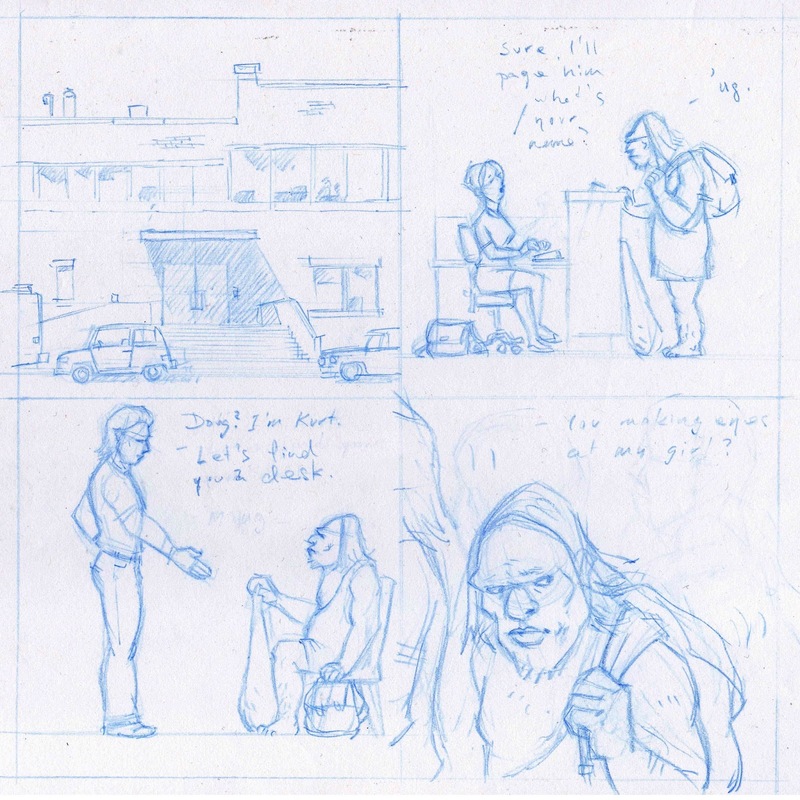 Maybe there are things we think we see, but are only imagining in roughs. I like the flat perspective in these though I can't say why. It reminds me of side-scrolling video games. Such "staging" simplifies the telling in that it isolates only what the audience needs to see and know. But something I really like is Doug's word bubble in the final drawing. See how it's a bit wonky or primitive looking? It is apt that a caveman would have a crudely drawn word bubble. GENIUS! Seriously, I've never seen one like that before and it perfectly suits a simple caveman and -- it's graphically pleasing. Perfect! Regarding the last panel, not sure if you can see it, but Kurt is saying "Are you making eyes at my girl, Doug? I did another version where we see Kurt more, but I kind of like this one as it focuses on Doug and his facial expression - kinda tough what with that HUUGE perhaps boney brow of Doug's. It's a quiet sort of story, so don't expect fireworks... at least not metaphorical sorts. My question from this first page is - how tall is Doug? I guess primitive man was much shorter than today's version, but everybody expects a caveman to rugged and huge. Which way are you going? I see Doug as somewhere between 5'10" and 6', but he slouches down considerably lower than that. Looking at the last panel, I think I drew him too short. He should look strong and rugged - this guy could wrestle a wolf away from his lunch box should he need to, but he's not Conan huge. Man, I hope you're not going to be disappointed about where this is going, assuming I can get there! I'm sure nobody's going to be disappointed. Bring it on!